Undecided for 2008? Looking for leadership instead of pandering? By my green candle Vote for Ubu in summer of 2008! When Alfred Jarry's Ubu Roi debuted in 1896 there was a riot that closed the theatre. Why? The title chracter. "He is everything that is foul in the world...devoid of any redeeming characterstic. He is not diluted with Iago's cunning or Macbeth's guilt and somehow he is not unlike us." Or unlike politics in 2008. 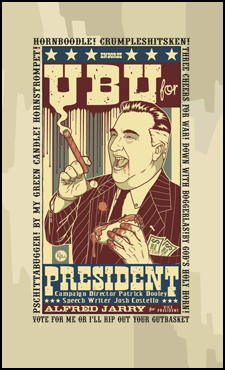 Cast your ballot for Ubu.